When it comes to bathroom faucets, there’s a huge variety of models out there in the market. From highly complicated touch-sensitive models to the standard manually operated single-hole faucets, there are a lot of different options for you to pick from. You can get an entry-level faucet for as little as $50 or spend upwards of $1000 for the high-end products by luxury brands. However, there’s no point spending that much money on a faucet unless you plan on building a designer bathroom. For most standard bathrooms, a good quality single-hole model with the right utilities and aesthetics are more than enough to take care of all your needs. So if you’re designing a new bathroom, and do not wish to overspend on faucets, we have the perfect product for you! We’ll be reviewing one of the most highly-rated bathroom faucets by Graff Faucets that comes with the perfect mix of utility, durability, and aesthetics. It comes with all the right features and is also pretty affordable. The Sento Single Hole Bathroom Faucet by Graff is one of the most versatile models we’ve come across in the mid-price segment. While this model is marketed mostly as a bathroom faucet, we found it to be a perfectly functional option for use in a wide variety of locations inside a home. Coming with a highly cost-effective price tag, this model is one of the best for all those who are looking for a feature packed and durable faucet that is not unnecessarily complicated. Simplicity is one of the most defining features of this faucet by Graff Faucets! We tested out the faucet inside our bathroom for the purpose of this review, and we were pretty impressed with what we got! Most mid-range models out there in the market do not usually offer a lot of flexibility when it comes to multi-purpose use. This model by Graff Faucets, however, is extremely versatile and can easily be used in a variety of different ways inside a home! From being a lavatory single lever mixer to an effective bathroom faucet, this model is flexible with its design. You can also use it as a wall-mount faucet, vessel faucet and even inside coordinating tub and shower systems. However, as we found out during our testing sessions, this faucet is most effective when used in a bathroom, though you’ll get pretty satisfactory results in every other way you decide to use it. As soon as we pulled the Graff Sento out of the box and had a feel of it with our hands, we could tell this one was built to last! Made with a solid brass construction, this faucet is superior when it comes to durability. While brass is a standard material used in faucets, not all of them have the same quality and construction. Being in the industry for a considerable time, we can easily tell apart cheap construction from the solid ones, and this one’s definitely the latter! Now aesthetics are something you just can’t ignore when buying bathroom faucets. They play a significant role in determining the overall looks of your bathroom, and it’s thus pretty essential to choose one that goes with your bathroom décor. 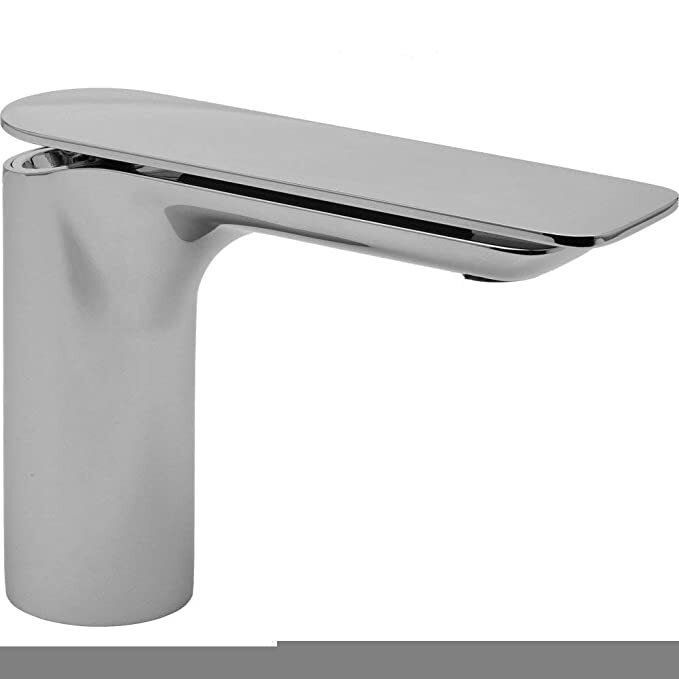 This model by Graff Faucets is one of the simplest yet stunning models you can get for your bathroom. No unnecessary visual features, just a sleek and shiny modern looking faucet that will go along beautifully in most bathrooms! The polished chrome finish along with the ultra-thin handle creates a beautiful streamline effect which is hard to find in most models. Overall, Graff Sento Bathroom Faucet is a simple and highly effective mid-range product for all those who are looking for a premium-quality single-hole faucet with no unnecessary complications. With a highly affordable price-tag, this is definitely a great value-for-money product!